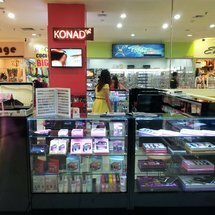 Konad co., ltd. is established to fulfill customer's needs for beauty specially nail care and skin care, we believe that knowledge, tradition, and years of experience is our pride, and that innovation is the key to keep the competitive edge and offer the best service for our customers. We are committed to offer you always truly innovative products, ideas and improved cosmetics. Konad stamping nail art, invented by konad co., ltd for the first in the world, is one of the most amazing inventions in the beauty industry history. It can beautify nails without demanding professional skill, high expense, long time and even ages. It is designed anybody can decorate nails by stamping pre-designed images at home in seconds. Konad stamping nail art kit is receiving women’s love from all over the world due to its easy handling and great expression. You can express various creativity of your own with konad. Konad iloje flobu and niju cosmetics. konad iloje flobu & niju cosmetics are made based on natural plant extracts and valuable materials derived from truly natural sources. And our long experienced chemists manufacture the best quality cosmetics by harmony of science and nature. We focus on highest and purest quality available on the worldwide market, so the quality compares quite well with famous foreign-made brands. Everybody who uses our cosmetics loves its quality and beauty design. We are providing you fast and competent support for all your questions regarding our products and our company, attentive and individualized customer service is our focus and goal.